Making it easy for your subscribers to opt-out of your mailing list will prevent recipient frustration and subsequent spam reports. When you think about it, there is no good reason to keep someone on your mailing list when they don’t want to be on it. They obviously aren’t interested in your email offers any longer and frustrating them with more emails will only cause problems for you. 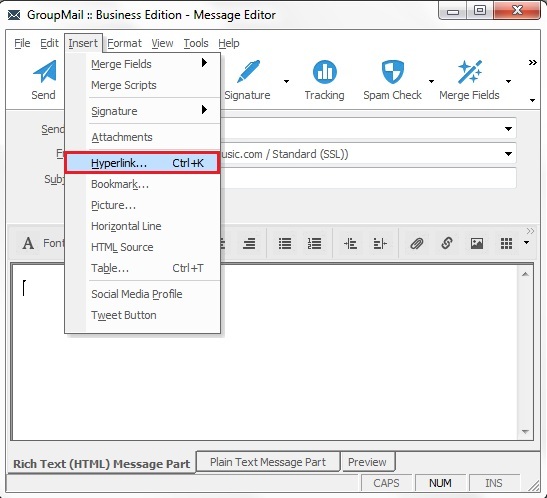 GroupMail’s Subscriber Add-on makes it easy to automatically remove unsubscribe or opt-out email addresses from your mailing list. At the link above, you will find instructions for configuring Subscriber to check your incoming POP3 server for unsubscribe or opt-out requests and removing those emails from your mailing list. But how do you add an unsubscribe or opt-out link to your email? 1. Type some unsubscribe instructions in your email and highlight the text that you would like to use as your unsubscribe link. * Of course, you will use your own email address in the unsubscribe link that you create. 5. Now, your unsubscribe link will be available in your message for your recipients to click if they wish to unsubscribe or opt-out of your mailing list. If you really want to get fancy, you can add other pre-formatted elements to your mailto: unsubscribe link, such as a cc: address(es) and even a few lines of text in the body. Here is the full mailto: link syntax. That’s all there is to it. 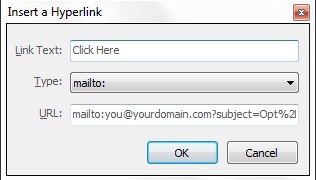 You are basically just adding a hyperlink to your email, except that instead of linking your recipients to a website, you are linking them to a pre-populated email back to you with their request to unsubscribe. If you run into any problems, email our support team.